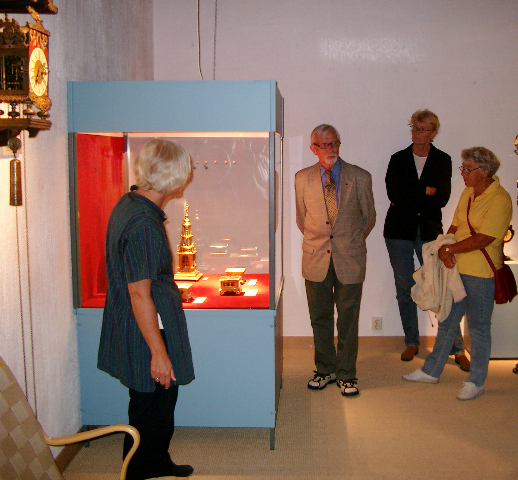 The exhibition was held at Västerbotten Museum in Umeå September 14 – November 19 2003. 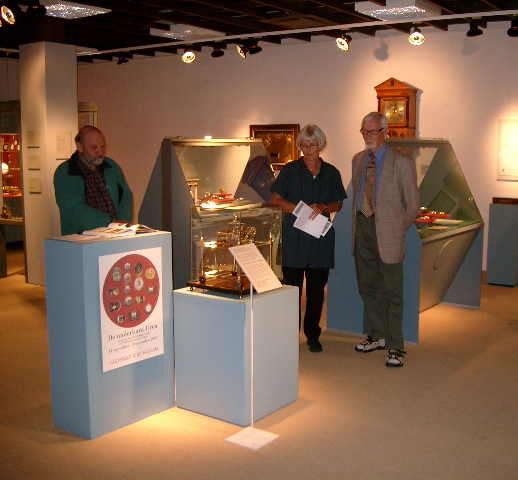 The exhibition was a collaboration between Västerbotten Museum, Finnish Maritime Museum and Watchmaker Albin Schaeder, owner of a very interesting and meaningful collection. 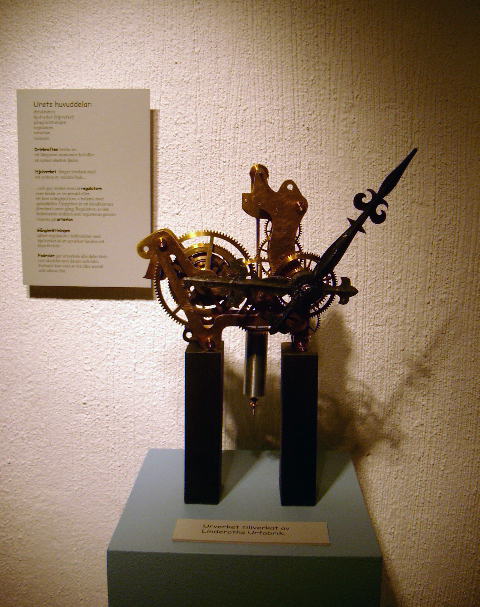 On 100 square meters, the development of the mechanical clock was displayed from a broad perspective. 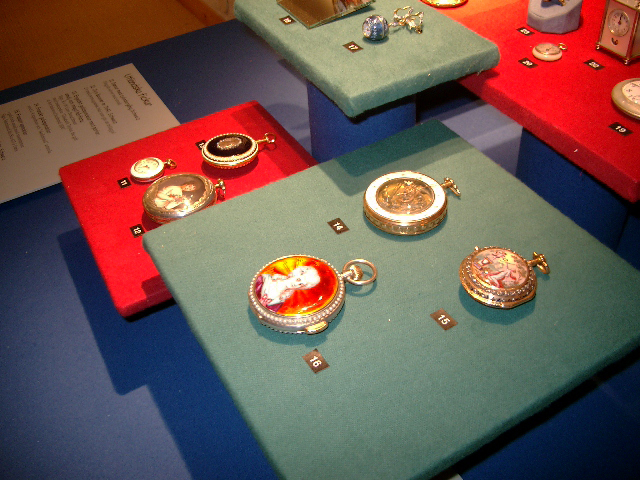 Here were early 16th century watches, elegant pocket watches embellished with enamel, diamond- and pearl decor from England, France and Switzerland. 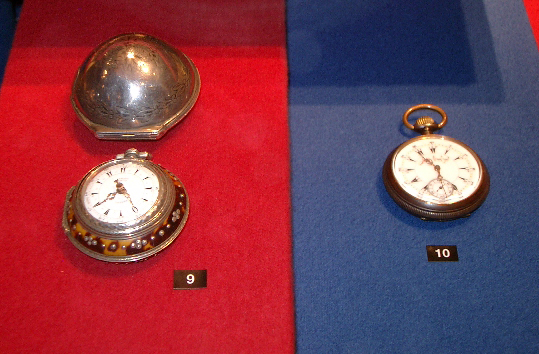 English and French pocket watches with a special design intended for the Turkish market were another interesting groups of watches on display. 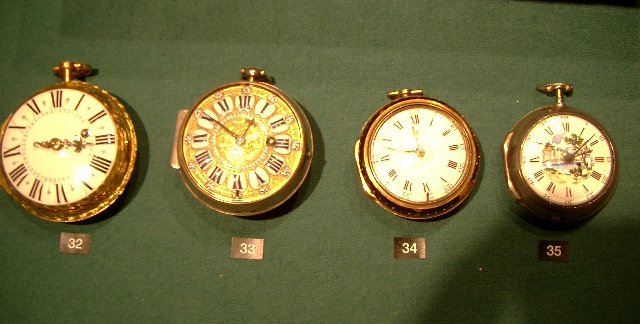 Some horizontal table watches from the 17th century, also known as Polish travel watches, were another interesting category. 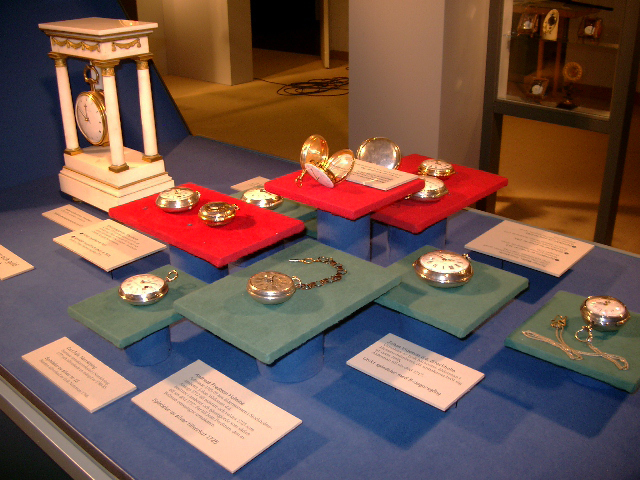 The focus of the exhibition was, however, on the main members of the Swedish watchmaker’s guild since its formation in 1695, such as Johan Wideman, Andreas Fredman, Erik Sundberg, Johan Lindkvist, Augustin Bourdillon, Jean Fazy, Jakob Kock, Petter Malm et al. 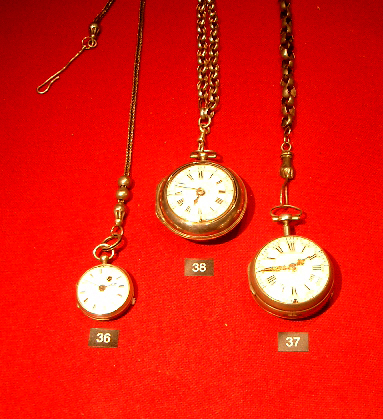 Many of their preserved pocket watches were to be seen in the exhibition. 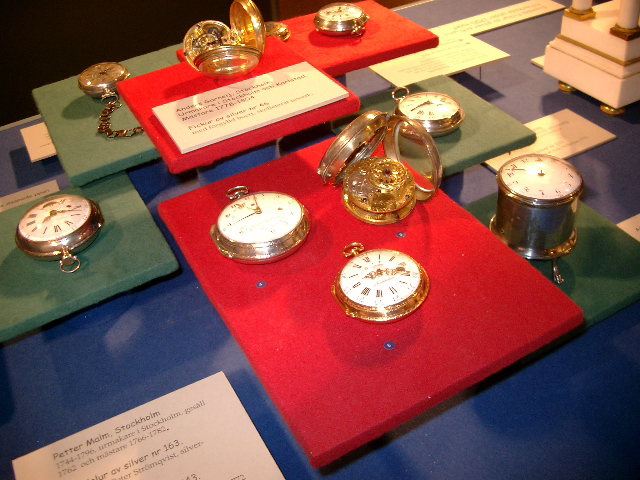 The pocket watch became at the end of the 19th and the beginning of the 20th century through Georges Frederic Roskopf and several American watchmakers so-called dollar watches every man’s property. 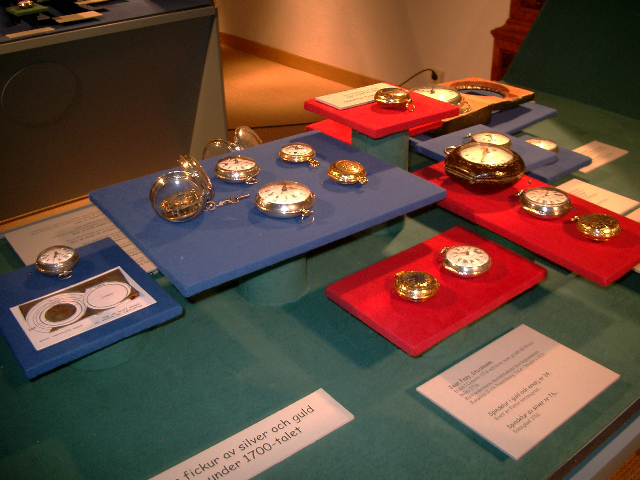 Many of these watches were shown in the category of watches that is certainly also still can be found in many cabinet drawers in Swedish homes. 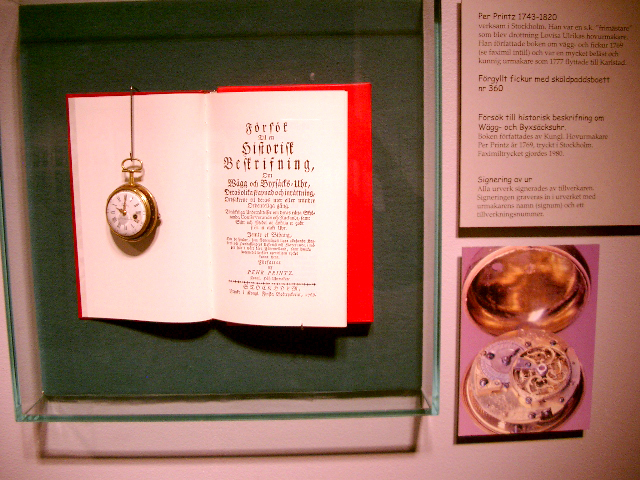 In the exhibition, the visitor could see the evolvement of the watches via different escapements until today’s modern Omega, with educational models that Albin Schaeder himself built. 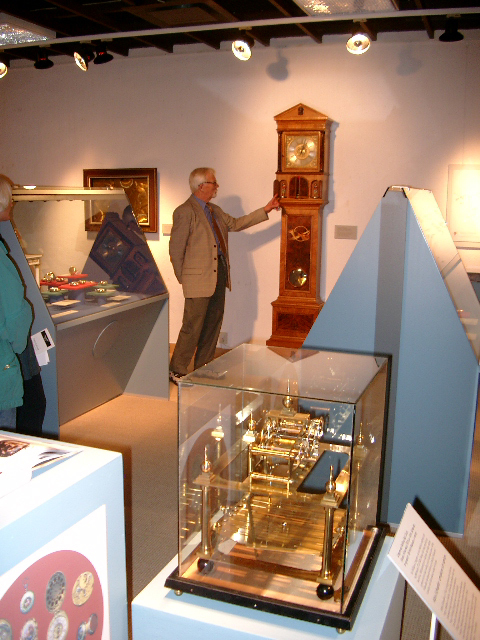 The exhibition included many Swedish and foreign watches from the 18th century, Roskopf watches and the dollar watches for the common workers in the late 1800s, table watches, wall clocks, etc. 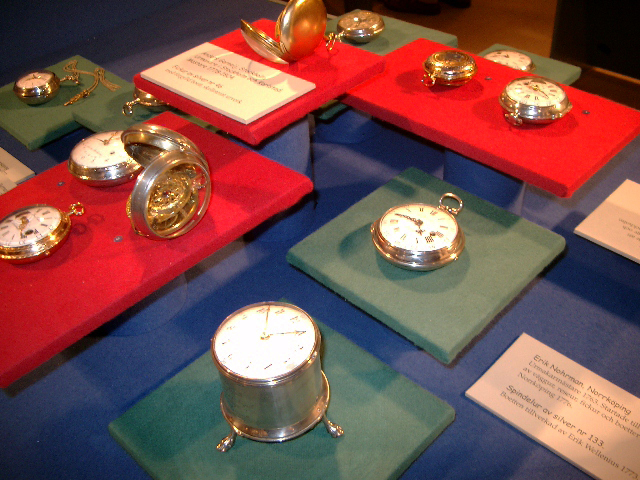 Here were watches from different centuries: 16th-century status symbols, the more accurate 17th-century pocket watches made by famous watchmakers in Stockholm and the late 19th-century cheap pocket watches for workers. 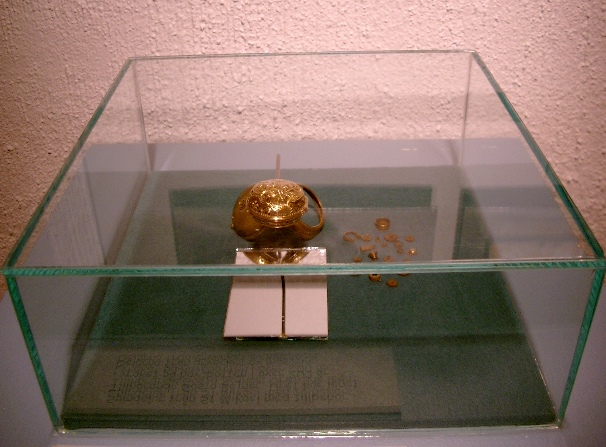 Even a pocket watch from the wreck St Mikael, sheltered under water for 200 years, was exhibited. 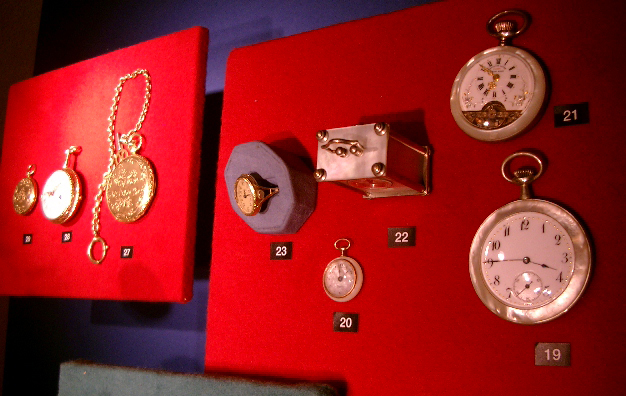 Many of the watches made by Albin Schaeder himself were also shown in the exhibition. 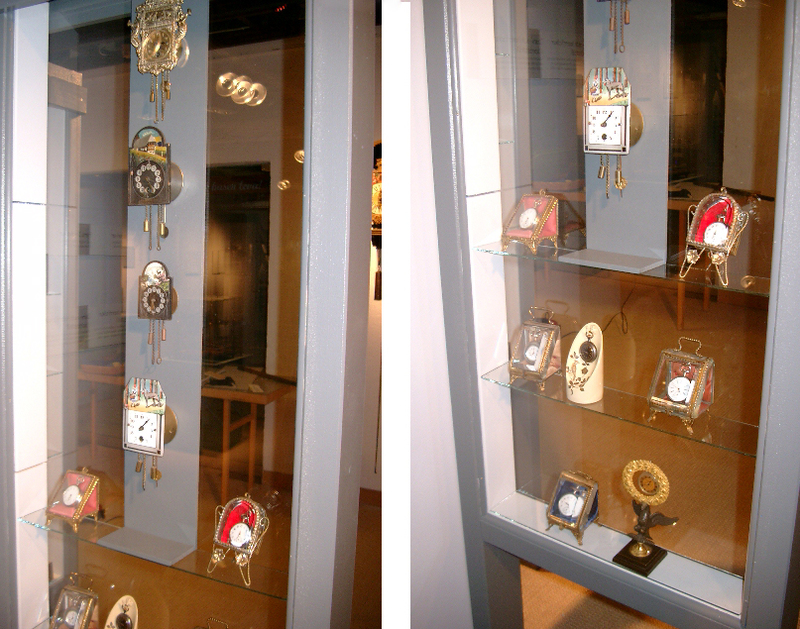 A suite of photos from the Swedish Watch exhibition in Stockholm in 1902 where the King, the Nobility and the institutions in Stockholm interacted with private exhibitors also gave perspective on the collection. 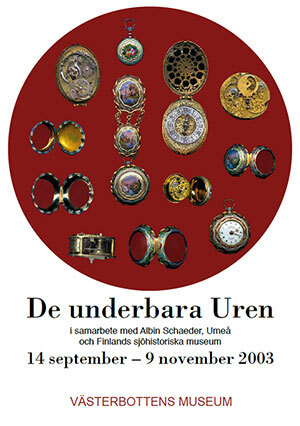 Albin Schaeder shows his book “De Underbara Uren” for interested visitors to the exhibition. Watch by Jean Fazy. Born in Geneva 1734, operating in Paris and Stockholm around 1754-65. 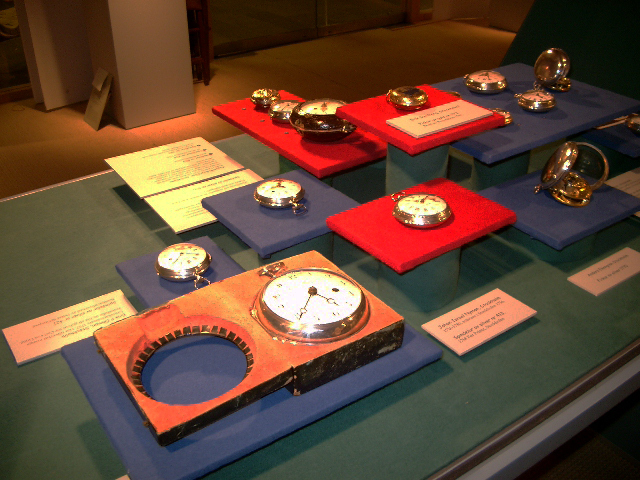 Then in S:t Petersburg and Moscow as Royal watchmaker to Katarina II. 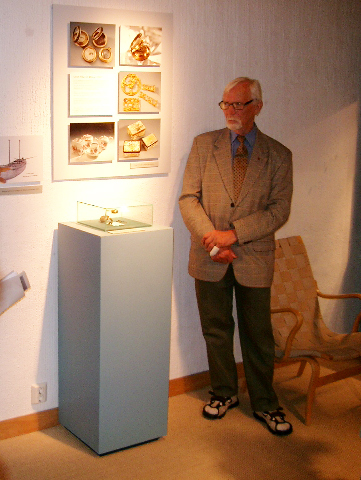 Albin Schaeder shows the watch that was salvaged from the ship St. Mikael in the archipelago of Åbo. 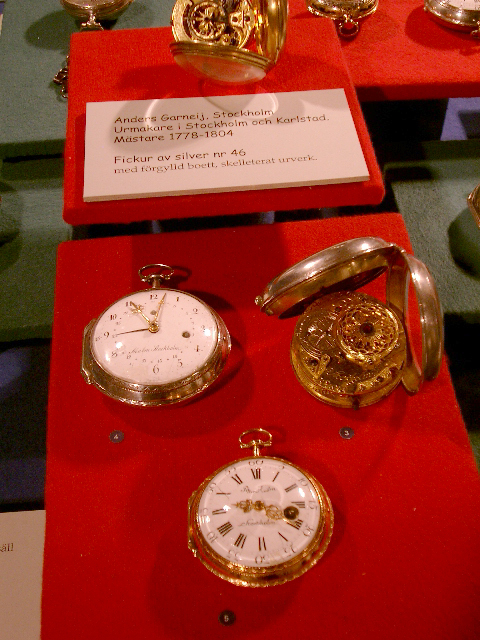 The watch was salvaged from the wreck, owner Gösta Bojner. 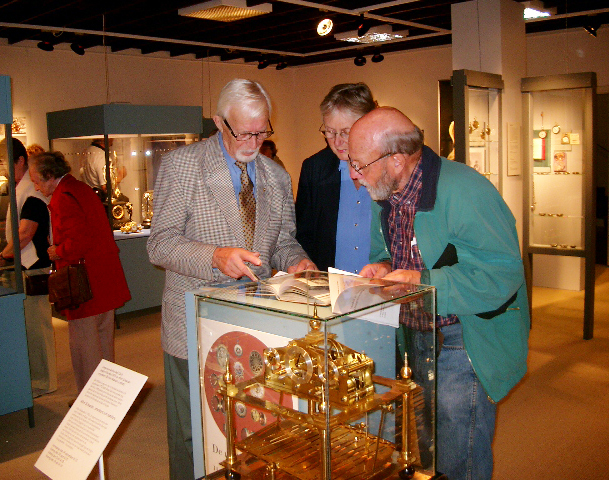 The Rolling-ball watch, manufactured by Albin Schaeder, on display. Floor clock and the rolling ball watch, both his own production. 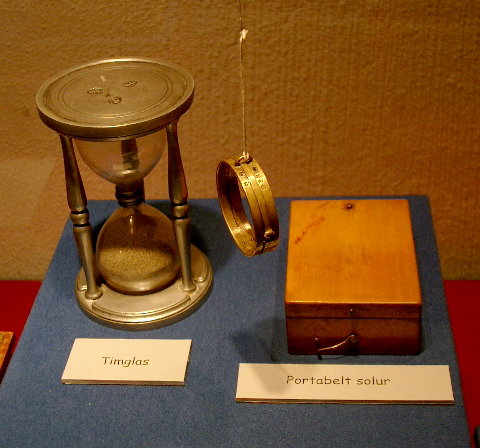 Hourglass sand watch, sun ring from the beginning of the 19th century and portable sun watch. 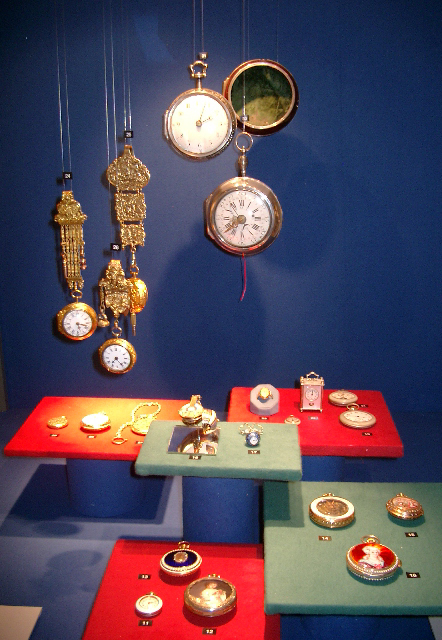 Watches for the Turkish market. 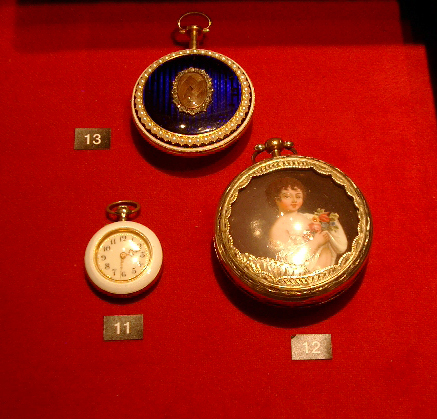 To the left: Edward Prior, 1832 in a turtle-shell case. 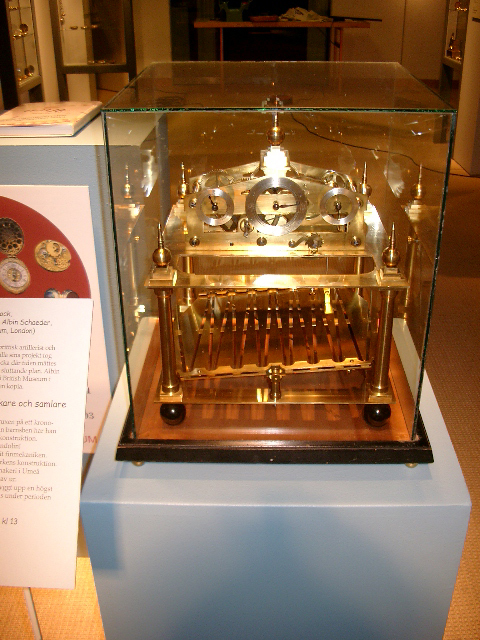 Clockwork by Per Printz (1743-1820) who became Royal watchmaker to Queen Lovisa Ulrika. 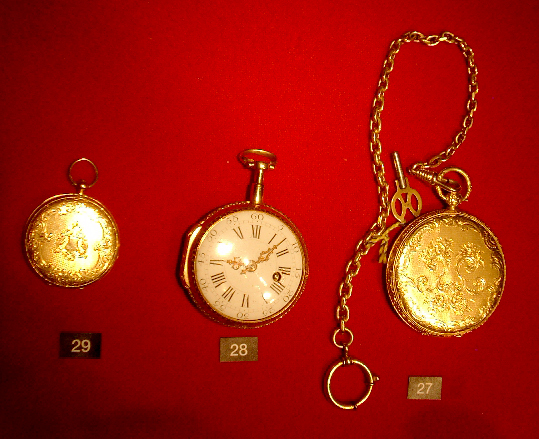 He was the author of the book on wall watches and pocket watches dated 1769. 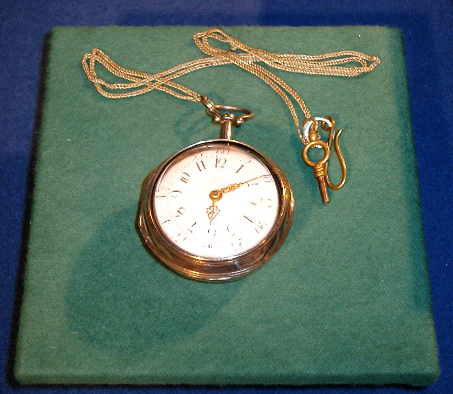 The watch is a gold plated pocket watch in a turtle-shell case. 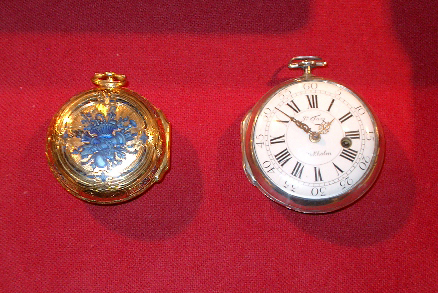 In the front, watches by Petter Malm (1744-1796), master watchmaker 1766-1782. 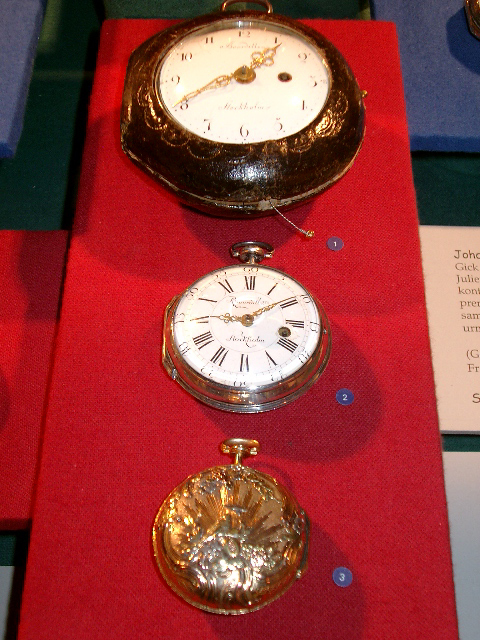 Hanging to the right: Costume watch/pocketwatch by Stroud, John S. active around the middle of the 18th century. Gold-plated clockwork with an engraved decor, plain inner case, outer case and chatelain in gold plated tombak with engraved decor with rocaille and figurines. 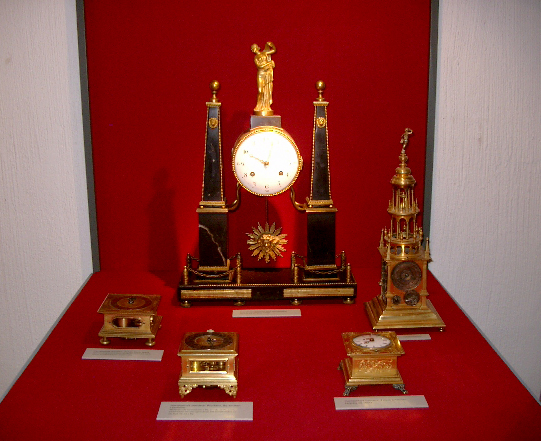 In the middle: French table pendulum from the 1750s with verge escapement. 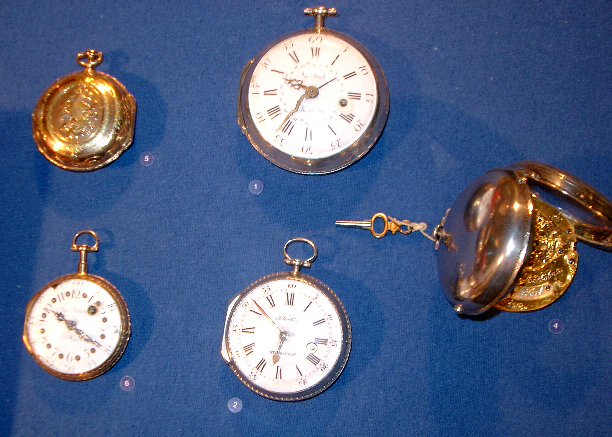 A collection of foreign pocket watches. 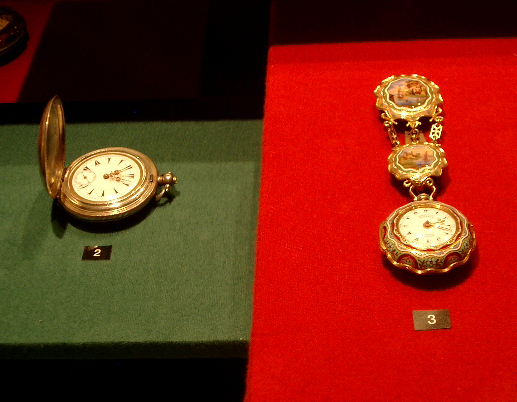 To the right: Marchand Fils, Paris, verge escapement watch in 18k gold, case with a motif in enamel and pink diamonds, around 1780. To the right: Markwick Markham Perigal, around 1780. 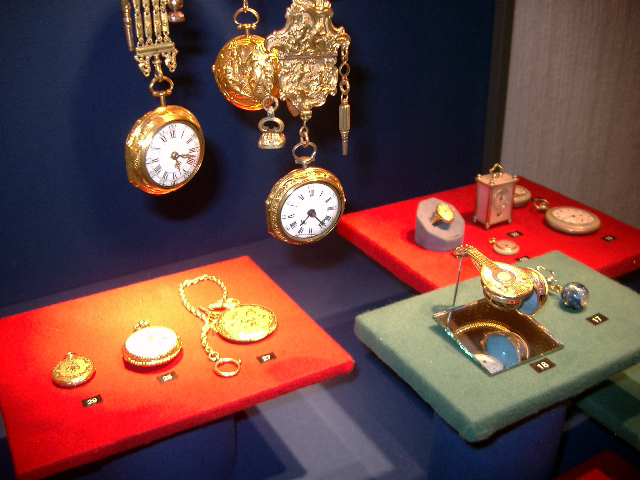 Watches in 18k gold for the Turkish market. 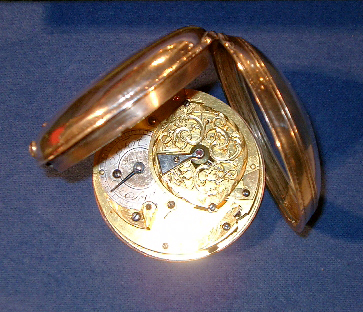 The clockwork is only 21 mm in diameter. 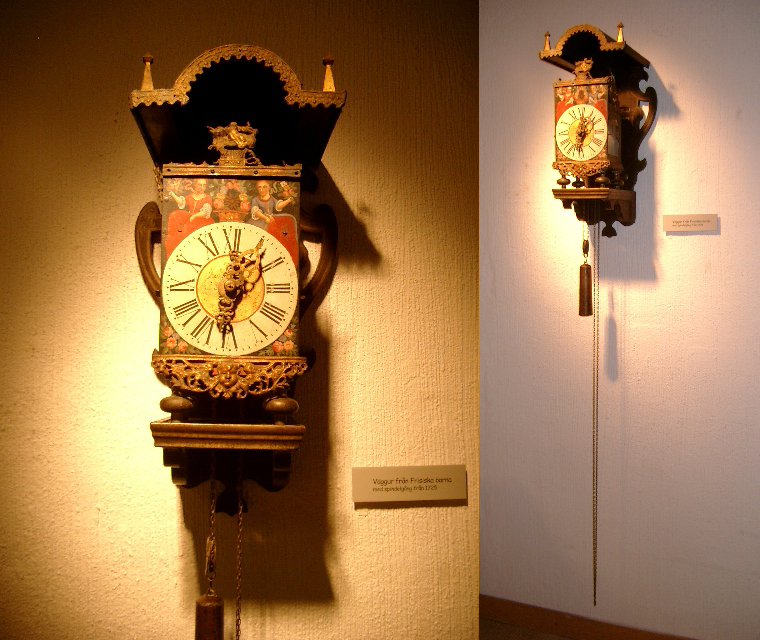 Lantern clock, 17th century, probably Germany. Partly bronzed and painted iron. 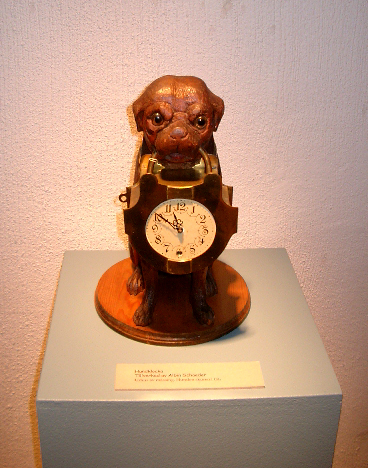 Dog holding a watch with brass clockwork, own production. 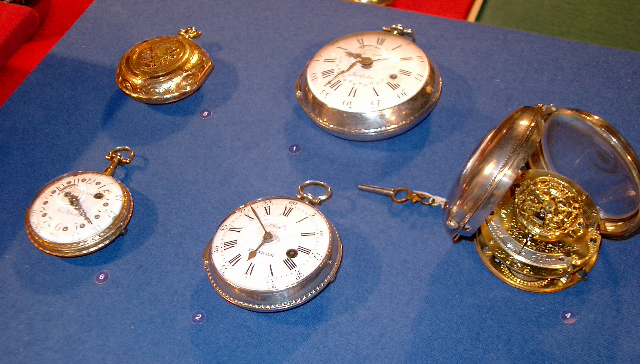 To the right: Table watch, Bulle-Patent, around 1930. Battery driven silver coloured watch dial. To the left: Watch with dancing porcelain dolls. 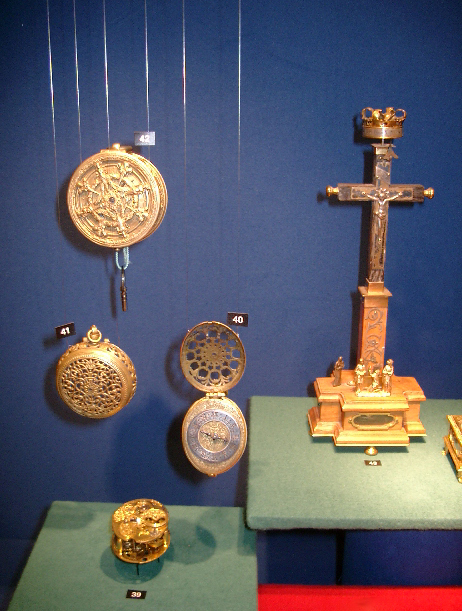 In the middle front: Table pendulum in gold plated and patinated metal from the second part of the 19th century. 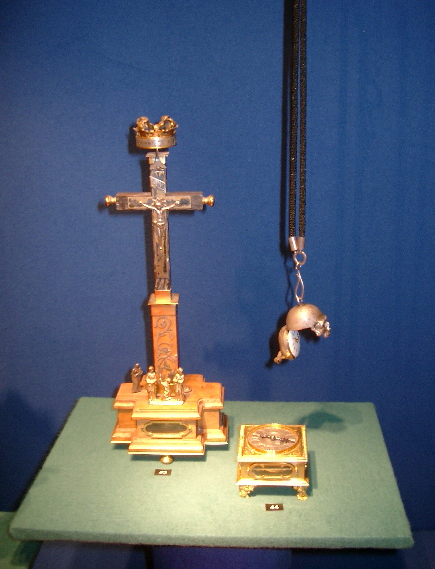 Crucifix watch with clockwork by Thomas Mounford St Albans around 1700. 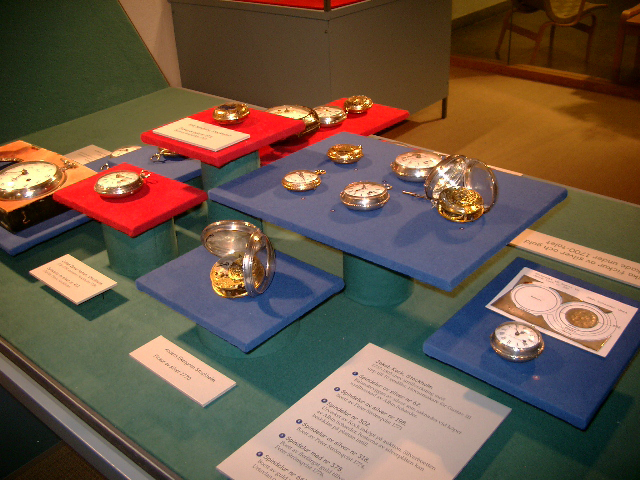 Table watch and skull watch – all own production. 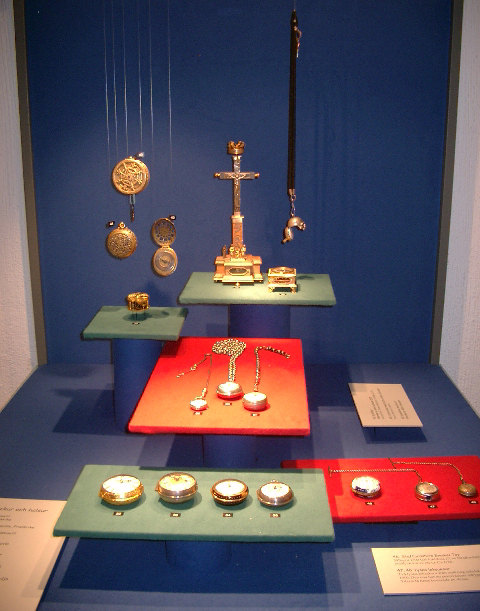 To the left of the crucifix watch, a pocket watch from the 16th century, probably Germany, with a brass hollow case, silver plated ring and verge escapement. 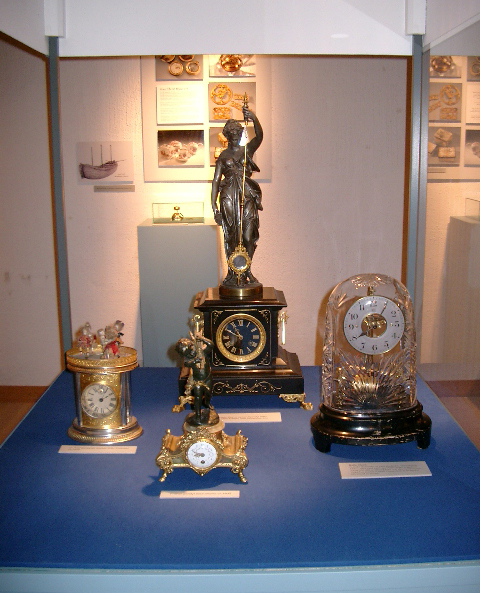 A variety of clock stands.